Home SB code , twitter code Swag Code Alert! 8/1/11 - First Code! Swag Code Alert! 8/1/11 - First Code! 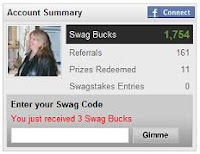 If you have the right code, it will then say "You just received 8 Swag Bucks"!